What do you do when your land is threatened, when your rights are ignored, when your community\'s health and safety are essentially sold to the highest corporate bidder? Chief Allan Adam of the Athabasca Chipewyan First Nation (ACFN)â€”1,000 members living on four reserves in northeastern Alberta, Canadaâ€”knows what to do: fight. 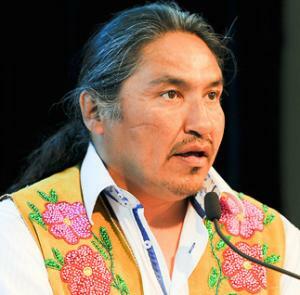 Alberta, Canada, is the ACFNâ€™s homeâ€”traditionally, culturally, geographically, politically. But that home is threatened because of the oil and tar sands industry. Oil and natural gas wells leave toxic wastes that contaminate plants as well as animals and their feeding habitats. They create huge amounts of greenhouse gases. They infringe on nativesâ€™ rights to hunt, fish, and gather. And they are correlated with numerous health problems, including particular kinds of cancer. Those wells continue to pollute the land, water, and air. At one point Adam and the ACFN were hoping that the provincial government would stop the encroachment on their land, but in 2012 Alberta came up with a plan that put only minor restrictions on development and, according to Adam, fell drastically short of the protections needed. Adam and the ACFN have been drawing big names to their cause. In 2013, rocker Neil Young launched an â€œHonour the Treatiesâ€ tour, donating all proceeds of ticket sales to ACFNâ€™s legal fund. Other celebritiesâ€”some concerned with the environment, others with native peoplesâ€™ rights, or bothâ€”have joined in.